This one features enhanced data read speeds of up to 160MB/s along with data write speeds up to 150MB/s. 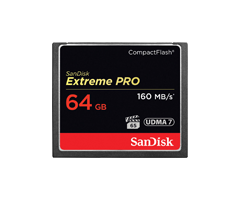 This Extreme Pro Compact Flash Card is designed to support both full HD and 4K video. This CF card is also compatible with both RAW and JPEG file formats.